Have you changed your iPhone to a newer one? My congratulations! It's great! I understand that as every person who has bought a brand new device, you are willing to have your photos, music and other media on it. Apple users have been appreciating iCloud from 2011 (7 years already! ), as it's so much handy to have the access to your files from all the devices. Your contacts are synced, your photos are always available for watching, your iPhone can be located with GPS. However, when you need to move all the info to a new iPhone, iCloud may be not so effective. Even if you had just 16Gb on your previous iPhone, if there were lots of information, media, files, and so on, it could take you a plenty of time to download everything to a new device. Even if you have a super-fast Internet connection. 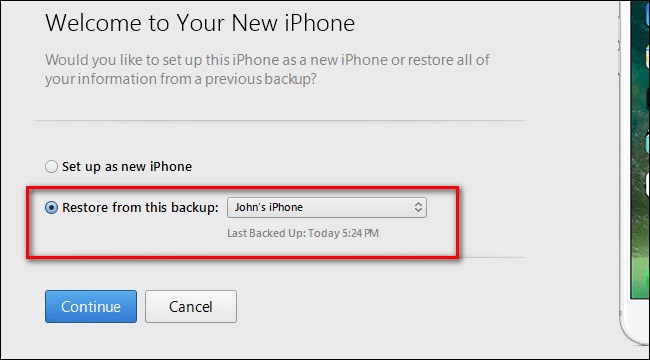 So, using iCloud could be a great deal when restoring information in case of losing a phone. But for transferring all the data to a new device I'd recommend using iTunes. Before we get to the tutorial, try to remember and keep in mind a few things. The first thing that you need is a computer (no matter if it operates on MacOS or Windows) where you can launch iTunes. I hope you have one, but if not, take it from a friend. Ensure that there's enough free space on the disk to create a backup. For example, you'll have to free 64 Gb of space, if your iPhone is full of information that takes 64Gb. No worries! You will delete that large backup file after transferring the info to a new device. Next, you'll have to sync your new iPhone with an old one with a cable. If your new device is 'secondhand', make sure that the previous owner hasn't left his iCloud logged in on the device. iCloud will be locked before he logged out from his account. So, you won't be able to back up until he does this. After you took both of your devices and a PC with iTunes on it, create a local backup. This can be done even in case you usually use iCloud backup and don't want to mess up your setup in iCloud. Run iTunes and connect your old iPhone to a USB port via the sync cable. Note that you shouldn't plug it into the charge port, as the process will take a plenty of time leaving you wondering about possible causes for that. Don't panic if it will pop up, as it's normal, however, it can be confusing in case you see if for the first time in your life. Every normal person could think that it offers to wipe your phone (set it up as a new one) or overwrite your device (restore from the backup). in case you have those backups on the PC. The first line is not it seems to be. It means creating a new iTunes profile for this iPhone. So, choosing this option wouldn't wipe your device. Choose it and go ahead. In the details window, find the 'Backups' section. Make sure that you've checked the 'Encrypt iPhone backup' line, it is situated on the left. Then click the 'Back up now' button. If you want all your data to be saved properly, encrypt the backup and create a password for it. It is needed for saving your passwords, Health/HomeKit information. After you click this button, wait for several minutes. iTunes needs some time to churn through the iPhone, backup the data to the PC disk. After everything is done, eject your old iPhone from the computer. This is the time for making magic. You can take a backup from any phone (for example, iPhone 5s) and move it to a newer phone (let's say, an iPhone X). You won't need to take any special steps for doing this. Take a new device, plug it into the PC you used for creating a backup with a cable. Let it mount into iTunes. When you see the same screen I've shown you above, choose 'Restore from this backup' and choose the backup from your old iPhone. 'Continue' after you have ensured that you had chosen the correct backup. Now, sit back and wait until your data transfers to a new iPhone. The following message will appear after the process is complete. It will say that your device needs to be restarted. iTunes will perform several checks after the restart. It may ask you to update your iOS in case the device may be upgraded to a newer system version. After that, you will be able to use the iPhone. All your contacts, photos, apps, and other data from your previous phone will be there. The final step is deleting your backup file from the PC. Enjoy your new iPhone now! That's all! I bet you'll agree that this 2-step method is much better than spending long hours on iCloud backups.